The entire Chinese internet stock group had been weakening of late, with names like SOHU, SINA, NTES, and others beginning to struggle. This followed months of leadership, as these stocks made big upside runs by building bases upon bases. The momentum shifted a few weeks ago, and in every case these stocks topped prior to the market’s pullback. (That’s why they call them leaders). 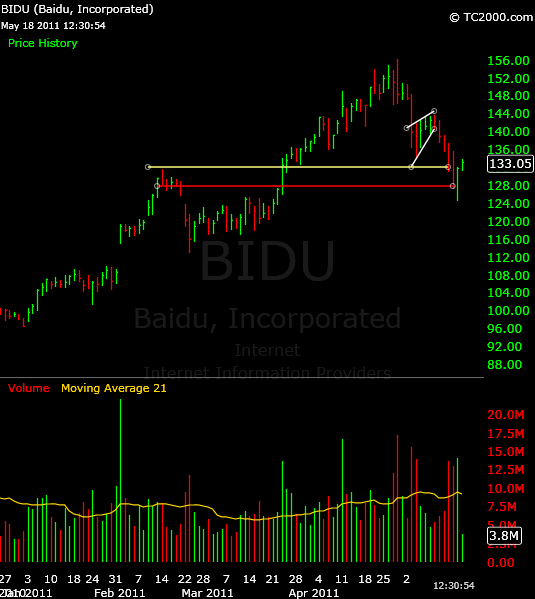 BIDU broke that rising trend line, a day after its counterparts NTES & SINA. That offered not only a clean entry for a short sale, but also a stock which had potential to play catch-up on the downside. This stock and the others in the group are currently bouncing from their lows, but they remain in a bearish series of lower relative highs on their daily charts. That is to say this bounce may get sold into again, so although this short sale is long since over, we have no evidence yet to support a lasting trend change. Until we do, these are stocks to watch for new short-sided entries to emerge. First, clean patterns are the place to focus. They make it simpler for me to recognize when to be IN a trade, and perhaps most importantly, when to be OUT of the trade. Tighter, more well-defined patterns help me be decisive, and in this game, that’s huge. Fourth, (and this goes hand-in-hand with the previous note), sharper moves are more prone to reversal. When your targets are in sight (or already hit) and the move is getting a bit stretched, expect the rubber band to snap back at least part way. Tighten your stops, book gains, and generally start expecting an imminent exit. Pigs truly do get slaughtered. I remember when BIDU split last year right around the time of the flash crash. I still see this as a buy and hold stock but I like the opportunity to buy in cheaper using your analysis. That may be true, although as a short-term trader I think it’s imperative to wait for signs of an upward turn before considering the long side in BIDU. Right now it’s caught in a downtrend, which means lower prices will continue until some level of support is established. Thanks for stopping by!